Heat oven to 350°F (325°F for dark or nonstick pans). Grease or spray bottoms and sides of two 8- or 9-inch round cake pans. In large bowl, beat cake mix, water, oil and eggs with electric mixer on low speed 30 seconds, then on medium speed 2 minutes, scraping bowl occasionally. Pour into pans. Bake as directed on box for 8- or 9-inch rounds. Cool 10 minutes. Remove from pans to cooling racks. Cool completely, about 30 minutes. Refrigerate or freeze cake 30 to 60 minutes or until firm. Using serrated knife, cut rounded top off cake to level surface; place cut side down. Cut cake as shown in diagram; arrange pieces on serving tray. Attach pieces together with a small amount of frosting. Spread a thin layer of frosting over top and sides to seal in crumbs. Refrigerate or freeze cake 30 to 60 minutes. Frost entire cake with remaining frosting. Use yellow fruit snacks or gumdrop slices for eyes, black gumdrop for nose and shoestring licorice for whiskers, lines on eyes and front paws. Store loosely covered. Print this handy template to make cutting out the pieces a snap. Can't find black shoestring licorice? 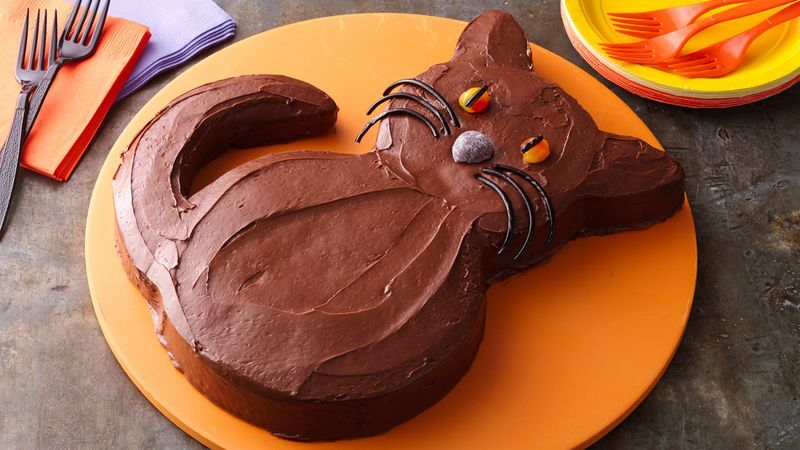 Use black decorating gel instead; it can often be found near the cake and frosting items in your grocery store.